Mission: Spread the word about NOAA’s Mission and Vision to the next generation of scientists! In college, Professor Susan Foster, taught me about being a lifelong learner. I had heard this term before – but never took to heart what it meant. She talked about my learning inspiring my students learning. She made me think about how I got my students attention, and planning where I wanted that attention to go. I am a LIFE LONG LEARNER, and my biggest hope would be to inspire the same yearn for learning in my students! I want my students to be as excited and enthralled by this experience as I was. They were the forethought in all of my blogs: what would interest them? What would make an impact? What would create more inquiries and questions? 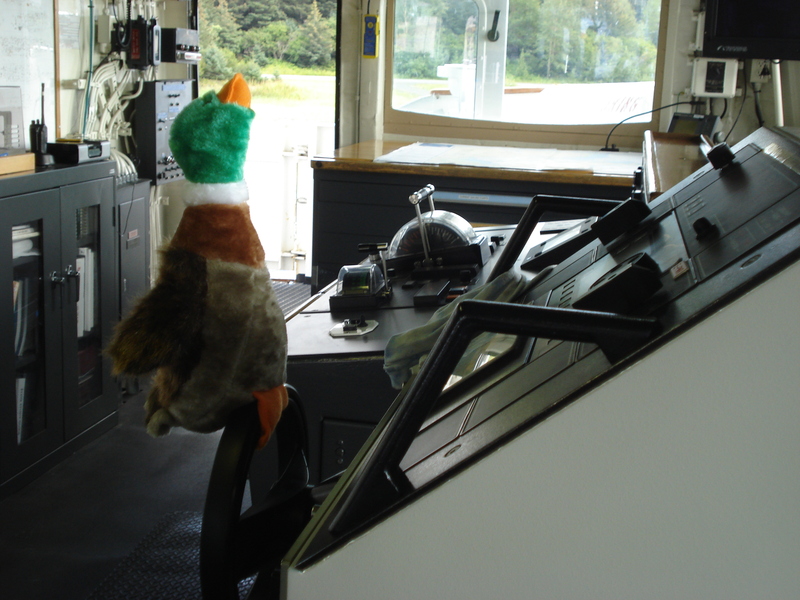 Monitor Mallard at the helm – driving the ship and inspiring the students of his school to think of a career at sea. I know that I have learned a lot more about NOAA and their goals and responsibilities as sea! The Teacher at Sea Program, in particular, aims to support NOAA related environmental literacy, outreach, and educational initiatives. 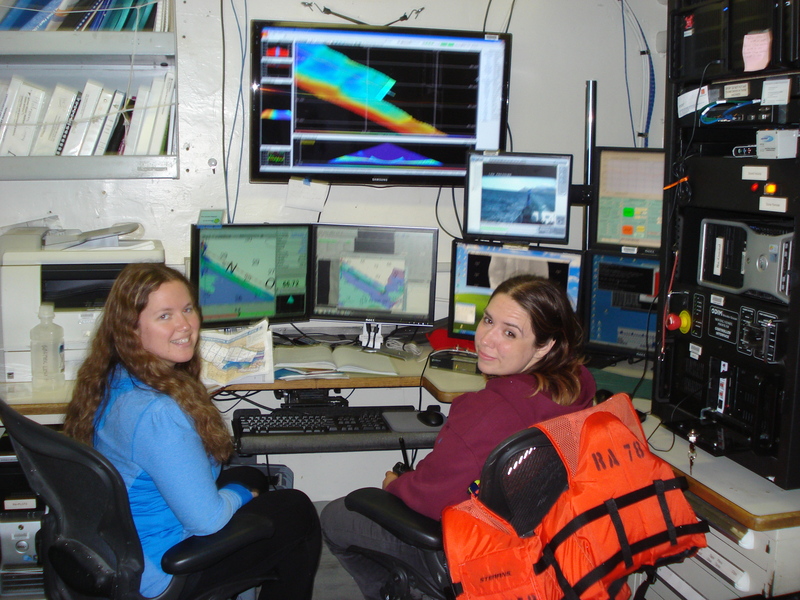 The TAS program also wants to support workforce retention within NOAA, and has a goal to recruit and retain a highly adaptable, technically competent and diverse workforce. 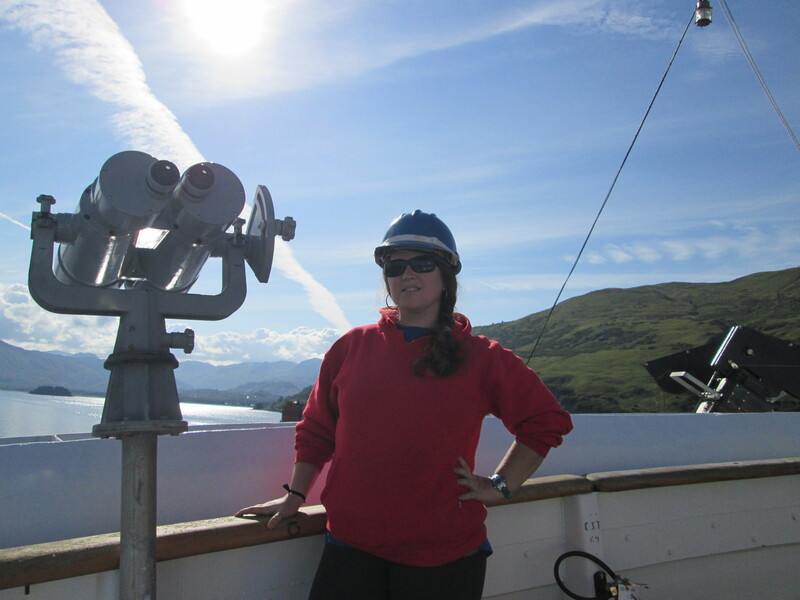 My personal goals from experiences aboard Rainier are to inspire students to want to learn more about SCIENCE!!! Specifically, I want to interest them more in: the Ocean, Marine Ecosystems, Technology, Hydrography, or NOAA and NOAA Corps. My students will not be limited by the location in which they live. I want them to see the ample opportunities available if their interests lie in marine life: NOAA Corps, Engineering, Vessel Assisting, Hydrography (Oceanography, Geography, Geology, GIS, etc), Food Sciences, Technology, etc. My experiences working and living with the crew of NOAA ship Rainier have inspired me to “spread the word”. CO EJ Van Den Ameele, XO Holly Jablonski, and all the NOAA Corps Officers for making me feel welcome and guiding me through my adventure. The Survey Techs for answering my never ending questions about hydrography, the necessary computer technology, and the constant processing of data. The Engineers for keeping the ship going while I was living aboard J, asking questions about my students (the next generation of engineers! 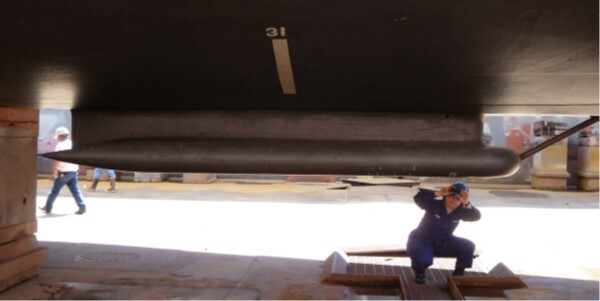 ), and trying to help me understand the innerworkings of the ship. The Coxwains for bravely attempting to (safely) teach me a little bit about driving a boat, and keeping me apprised of wildlife sightings in the area. The Vessel Assistants, Stewards, and all other crew for being friendly, making me feel welcome, keeping me well fed, keeping me safe, and letting me/ showing me how to help throughout our time at sea. I write this last entry, as the first, from my couch in Northwest Arkansas – this time, with a whole new perspective. 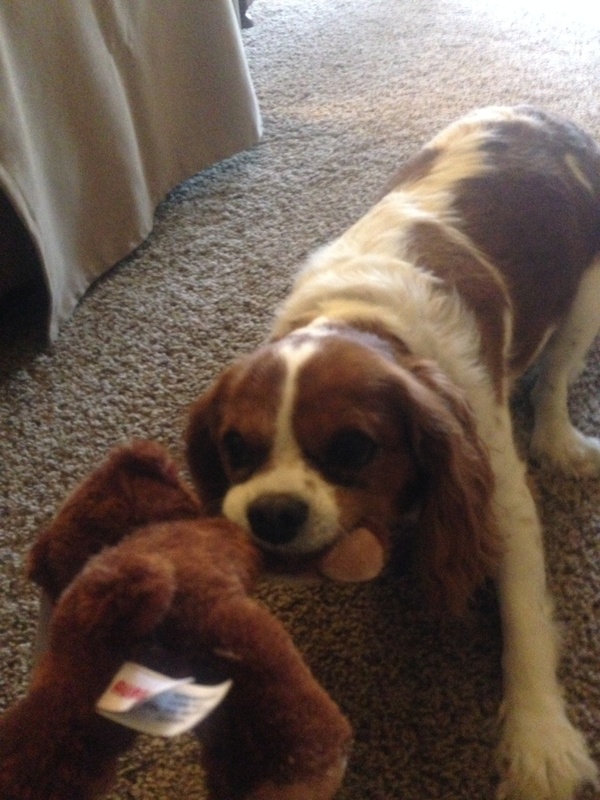 My puppy, Bella, attacks her new Kodiak Bear as I reflect on my time in and around Kodiak, aboard the Rainier. Almost three and a half weeks ago, I boarded an airplane (three actually) from Northwest Arkansas to Kodiak, Alaska. As I was stepping aboard the NOAA ship Rainier, 112 ten-year-olds were preparing to step into my science classroom for the first time. What were they feeling? What were they thinking? I felt much like I expect new students do on the first day of school, and wondered the same types of questions: Would people be nice to me? Who would I sit by? Would I be smart enough? Would I miss my home and my family? Would I make friends? Would I UNDERSTAND? After a day or two all of my nerves began to ease, as I began to figure things out. I also found that asking a quick question would often get me not only the information I needed, but the introduction to a new person. And I say all I did above, not because the Rainier and its crew didn’t take good care of me: they took excellent care of me! They introduced me all around, they gave me tours, gave me several days on each assignment, talked me through things, checked on me, fed me really well, and answered, answered, and re-answered all of my questions! However, I say all I did above because of my students. It is not often I get the chance to walk in their shoes. As their teacher, I feel like I know them- and understand them- because I have been teaching for years, have had many of their siblings, and of course, once went to elementary school myself. I never walked in their shoes though. I never experienced everyone speaking to me in a language I am not very familiar with. I never experienced an organizational (family) structure I was not familiar with. I never had so many tools and systems of information that I didn’t know what to do with. My biggest take away from this experience is UNDERSTANDING – the understanding that I do not truly understand what each student feels when they are: new to the school or class, don’t speak any of the language, haven’t been to a school like Monitor or a district like Springdale before. It is with this realization that I will approach my students tomorrow – with an even more open heart and mind, more patience, and more tools and strategies in my belt – just in case I need them! 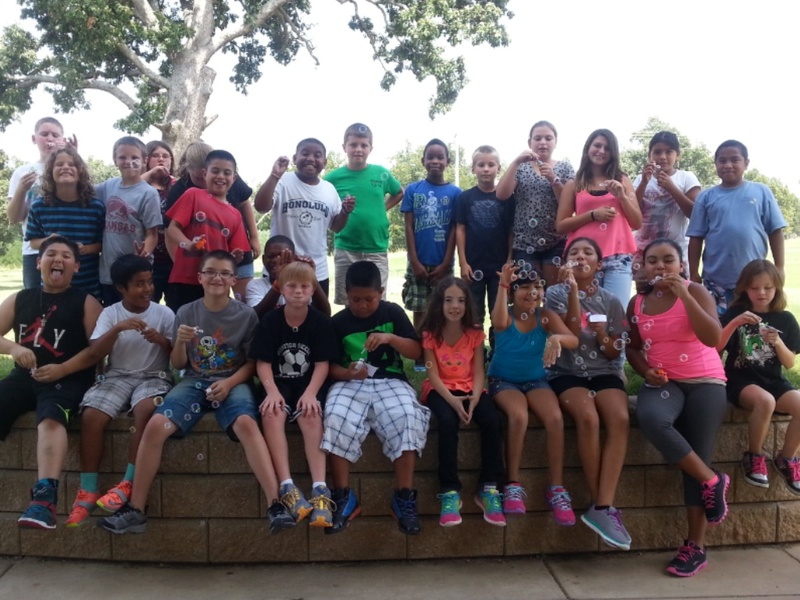 My homeroom students, “bubbling” over with excitement (I hope)! I can’t wait to meet them tomorrow – and only hope they are as inspired by me as I am by them and their questions/comments/emails throughout my journey. The past week/ week and a half, docked alongside the US Coast Guard pier in Kodiak – it was easy to see people settle into a routine. This morning, however, we are preparing to leave the Coast Guard base – there is something in the air. Without it being spoken, it is clear both the NOAA Corps officers and the wage mariners are excited to get underway. THIS is what they signed up to do! 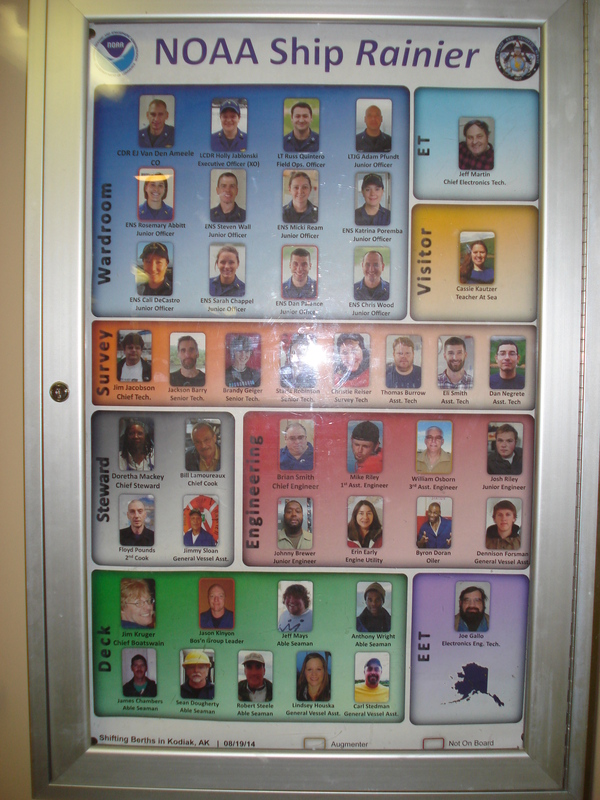 This is the Crew Board for all team members currently aboard the Rainier. ENS Micki Ream updates the crew board each leg. This morning, in preparation for getting underway, all NOAA Corps officers met for a Nav (navigation) Briefing, to go over the Sail Plan, to make sure all necessary parties were prepared and informed. NOAA Corps is one of seven uniformed services in the United States. 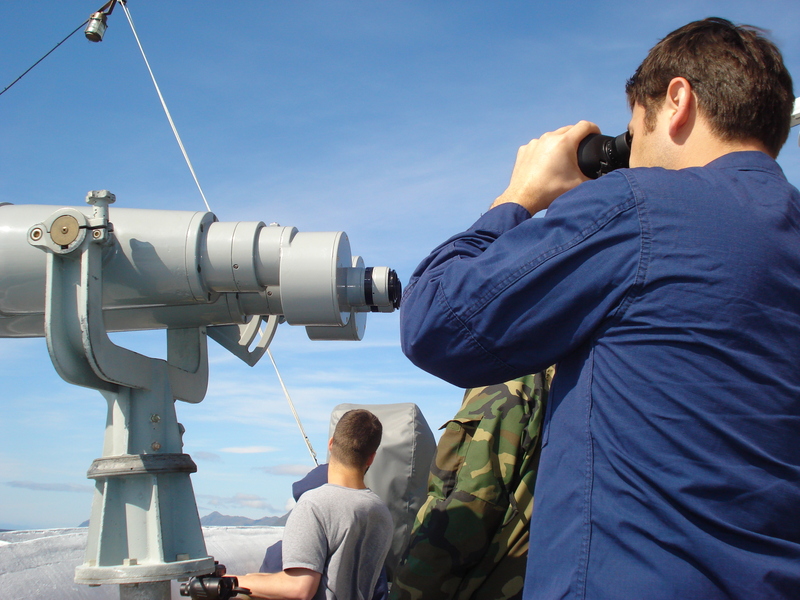 Its commissioned officers provide NOAA with “an important blend of operational, management, and technical skills that support the agency’s science and surveying programs at sea, in the air, and ashore.” (www.noaa.gov) The Sail Plan, prepared today by Junior Officer, ENS Cali DeCastro, includes step-by-step guidelines for sailing to our next destination. For each location or waypoint along the route, the sail plan gives a course heading (CSE), Latitude and Longitude, distance to the that point (in Nautical Miles), the speed (in knots) the ship will be cruising at to get to that point, and the time it will take to get there. Today we are headed to Japanese Bay, and our cruise to get there is about 98 Nautical Miles and will take us almost 9 hours. As seen from the fantail (back of the ship) – TEAMWORK! SAFETY FIRST! It is important to note that nautical miles and knots at sea are different than linear miles and miles per hour on land. Nautical miles are based on the circumference of the Earth, and are equal to one minute of latitude. (http://oceanservice.noaa.gov/facts/nauticalmile_knot.html) Think about the Earth and what it would look like if you sliced it in half right at the Equator. Looking at one of the halves of the Earth, you could then see the equator as a full circle. 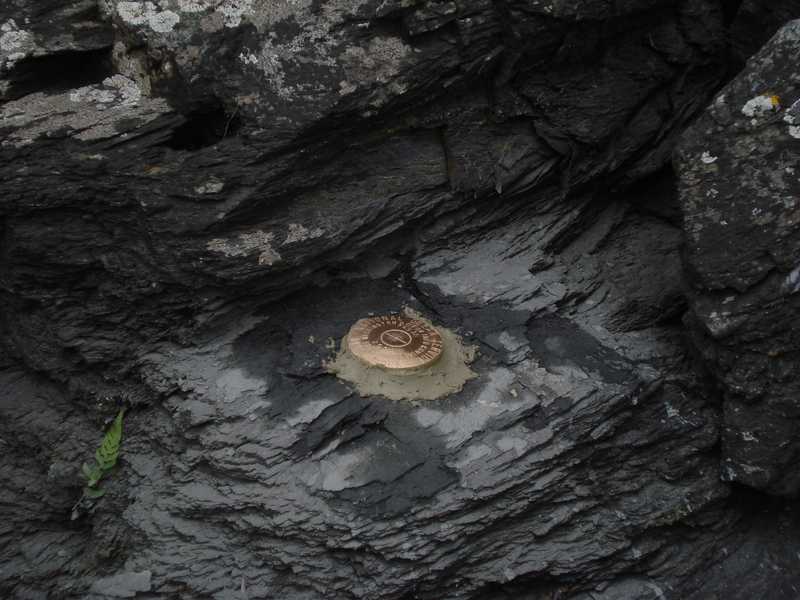 That circle can be divided into 360 degrees, and each degree into 60 minutes. One minute of arc on the Earth is equivalent to one nautical mile. Nautical miles are not only used at sea, but also in the air, as planes are following the arc of the Earth as they fly. 1 nautical mile = approximately 1.15 miles. A knot is a measurement of speed, and one knot is equivalent to 1 nautical mile per hour. It is also important to be aware of all the safety procedures on board. There is a lot to keep track of – but the Rainier is well prepared for any kind of emergency situation. Prior to departing the Coast Guard Base this morning, our emergency alarms and bells were tested. Emergency bells and whistles are used during a Fire Emergency, an Abandon Ship situation, or a Man Overboard situation. In any situation, every crew member has an emergency billet assignment. This assignment tells you where to muster (meet), what to bring, and what to do – dependent on the situation. For fire and emergency, abandon ship, and man overboard each person has a different assignment. Within 24 hours of setting sail, the entire crew does safety drill practice (We did this in the early afternoon today!) For fire and emergency both the general alarm bell and the ship’s whistle will continuously sound for ten seconds; for an abandon ship situation, seven short blasts on the ship’s whistle and general alarm bell will sound, followed by one prolonged blast; and for a man overboard there will be three prolonged blasts of the ship’s whistle and general alarm. Safety is not only a concern in emergency situations – it is at the forefront of all operations aboard the ship. 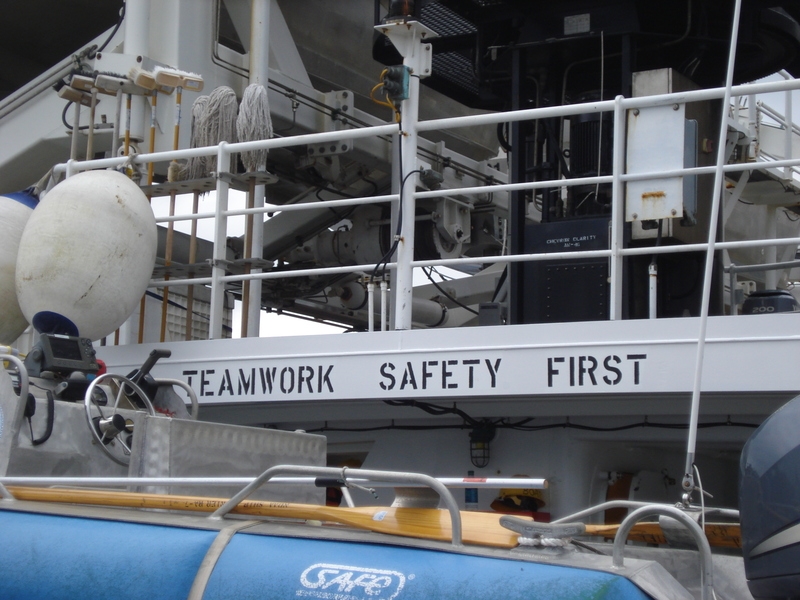 Proper safety equipment is donned at necessary times, especially when working on deck or on the survey launches. Personal Floatation Devices (PFD) are worn anytime equipment is being deployed or handled over the side along with safety belts and lines for those handling equipment over the side. Every crew member is issued a hard hat and must be worn by everyone involved in recovery or deployment of boats and other equipment. Closed toed shoes must be worn at all times by all crew and crew must be qualified to handle specific equipment. 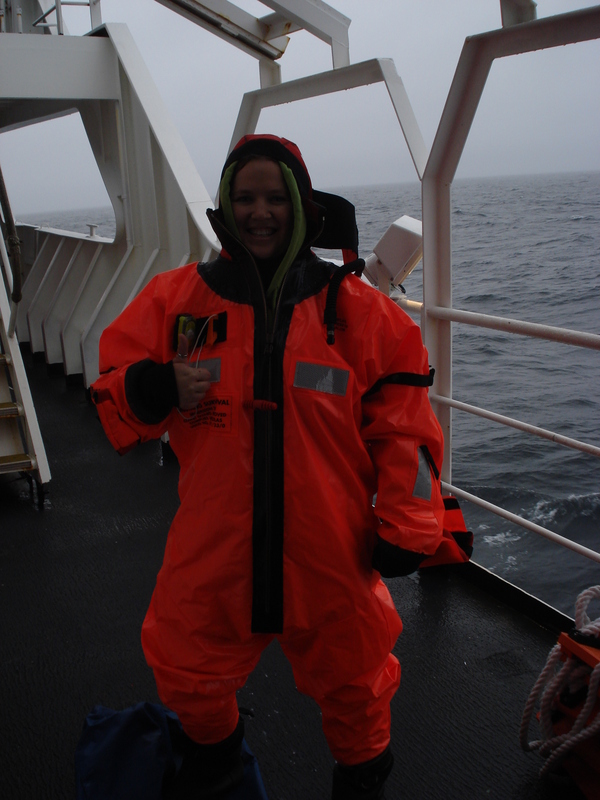 Everyone is also issued an Immersion Suit (survival suit), affectionately nicknamed a Gumby Suit! The Immersion suit is a thermal dry suit that is meant to keep someone from getting hypothermia in an abandon ship situation in cold waters. Believe it or not – I have made a lot of connections from the Rainier to my school. At the bottom of our daily POD’s (Plan Of the Day), the last reminder is, “Take care of yourself. Take care of your shipmates. Take care of the ship!” The environment here has not only made me feel welcome, but safe as well. 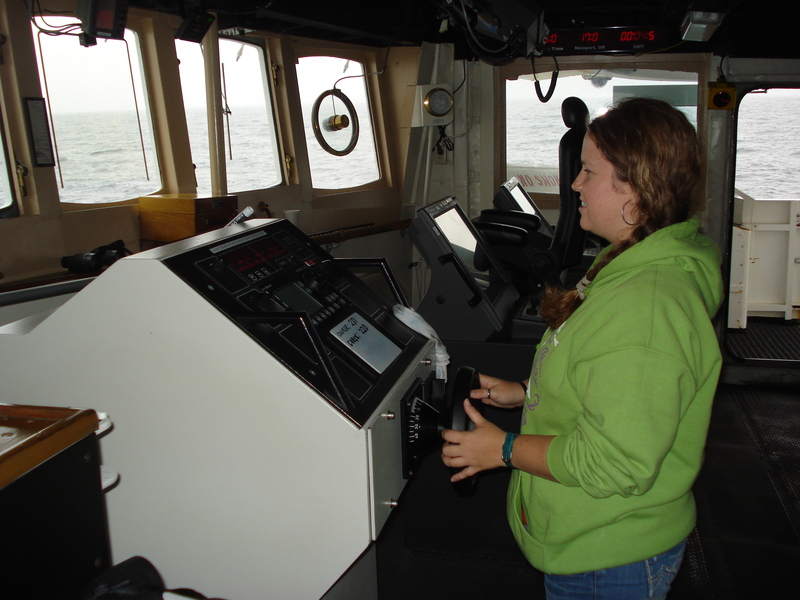 I even felt safe when they let me man the helm (steer the ship). Out of picture, Officer LTJG Adam Pfundt and Able Seaman Robert Steele guide me through my first adventure at the helm! Here is a wildlife update. I saw Whales today! I think there were Humpback Whale. 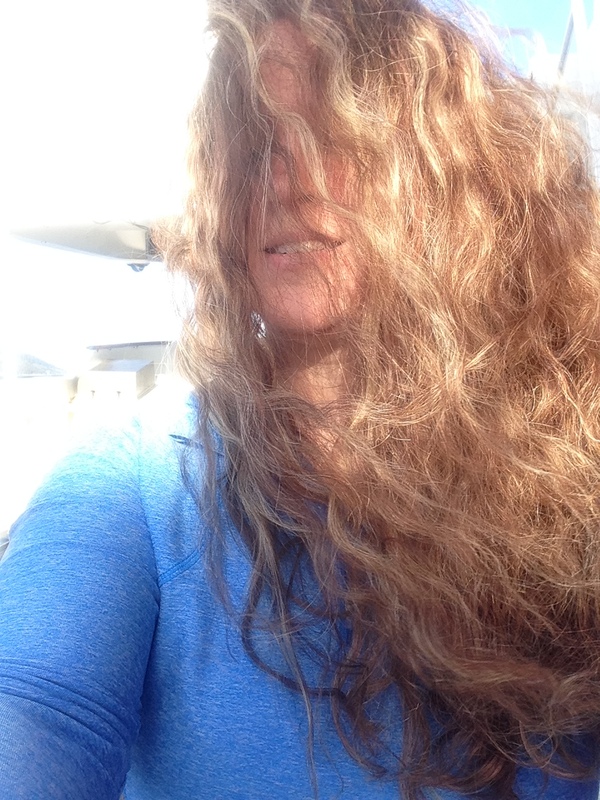 I saw quite a few blowing out near the ocean service. I marked three in my graph because I only saw three jumping and playing in the water! Why is teamwork important? What can you do to be a good team member? Can you make any connections between the mission and rules I am learning on the ship and the mission and rules you are learning at school? 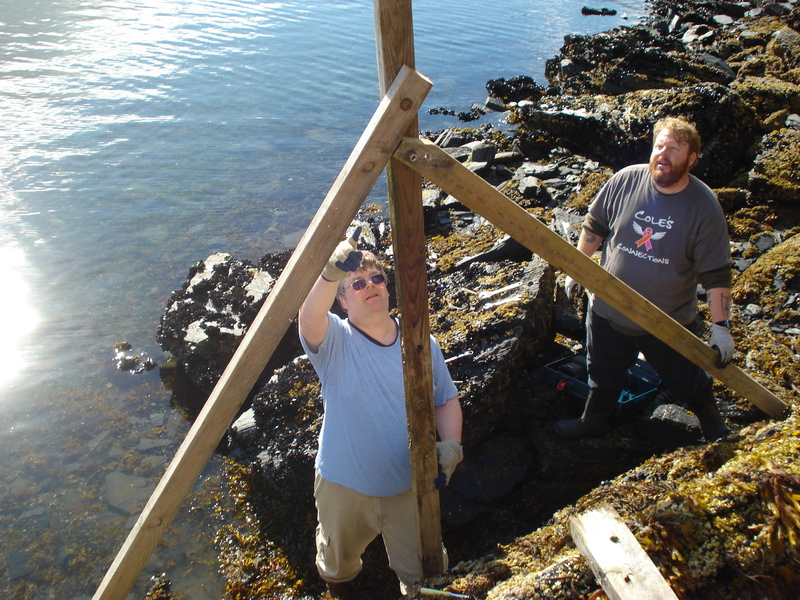 Survey work continues today (Yes- even on the weekend) in the Woody Island Channel. While it is easy for me to see why this area is navigationally significant, it made me think about how one would identify which areas need to be surveyed. 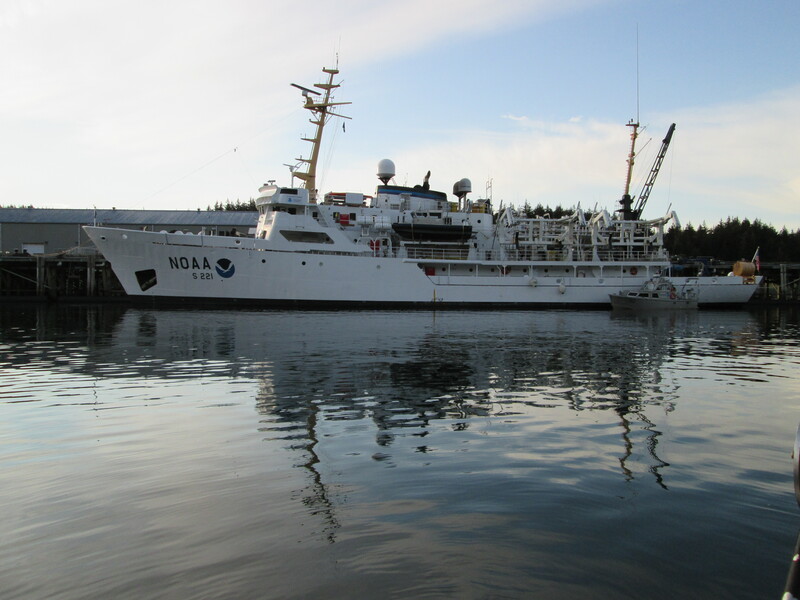 The National Ocean Service compiles data and prioritizes areas in need of surveying. 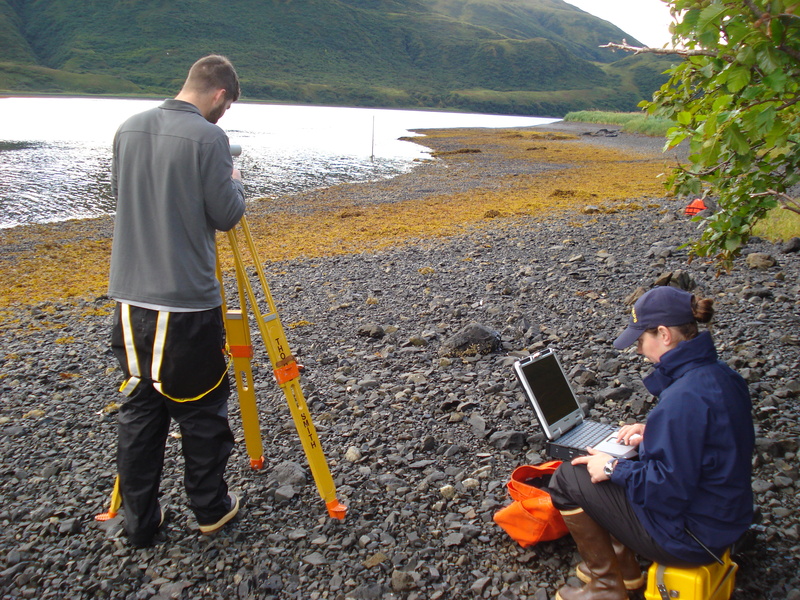 Examples can be seen here for NOAA’s survey priorities in and around Alaska. 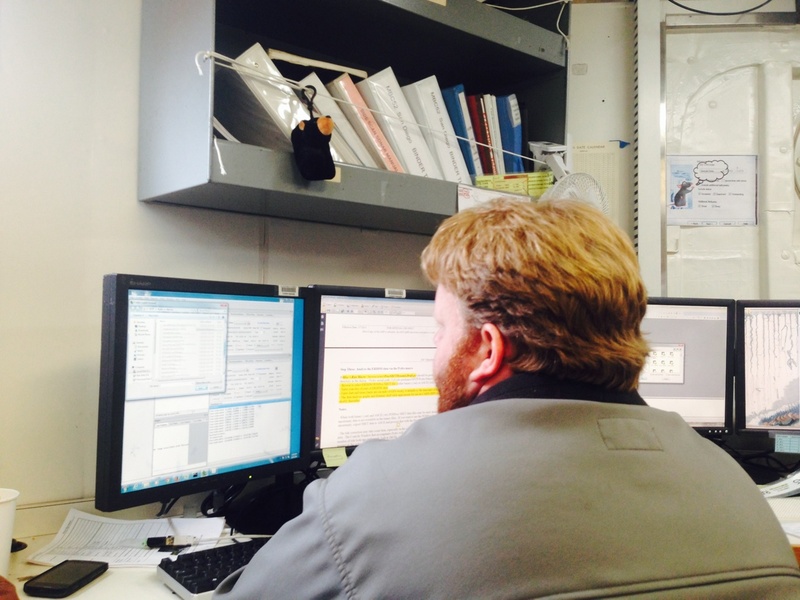 Using the areas of critical priority the Hydrographic Surveys Division (HSD) writes project instructions. Project instructions include all necessary data and guidelines, including: project name, project number, assigned field unit (ship), assigned processing branch, planned acquisition time, purpose and location of survey, and necessary supporting documents. On the project instructions, the Hydrographic Surveys Division also splits the assigned survey areas into sheets, or manageable sections. 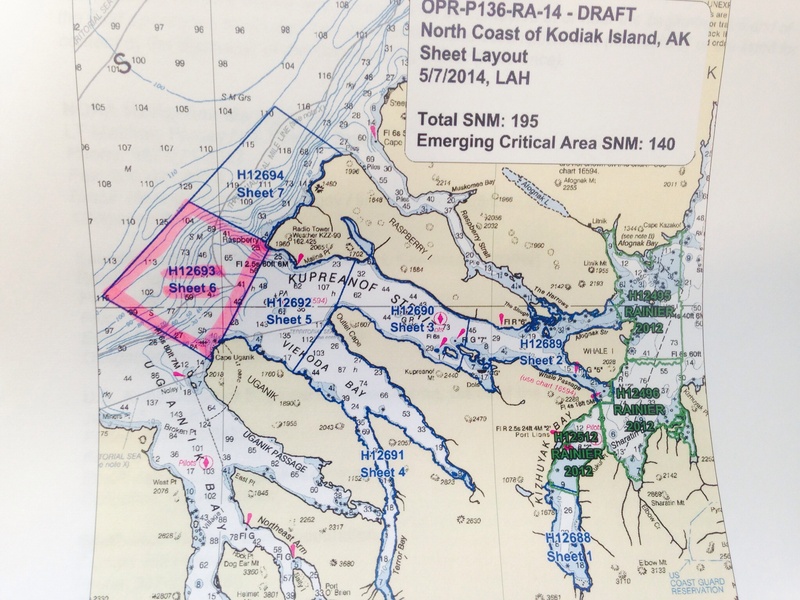 This is a completed sheet from the North Kodiak project. 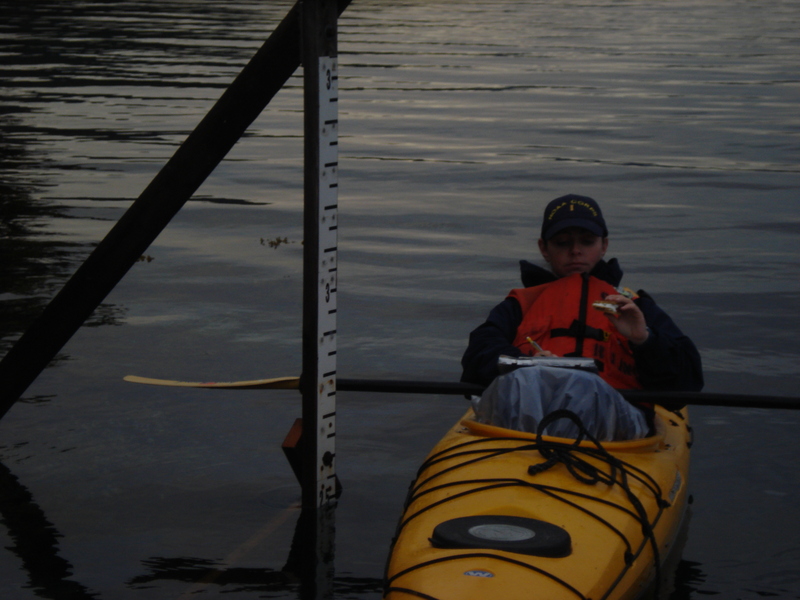 Each sheet is then assigned to a Hydrographic Survey Technician (HST), a Hydrographic Senior Survey Technician (HSST), or a NOAA Corps Officer. Usually, one person will be the sheet manager and another will be the sheet assistant. The sheet manager is often teaching and guiding the sheet assistant, to train them to be able to do this work on their own in the future. The sheet manager is also responsible for dividing the sheets into polygons. Polygons for hydro surveys are used to divide the survey into smaller sections. When planning polygons, it is important for the sheet manager to follow specific guidelines- shapes cannot just be randomly drawn on a sheet or chart. The deeper the water, the larger the polygon can be; the more shoal the area, the smaller the polygon should be. Polygons should be drawn with the ocean contours, and should be planned for launch boats to run them from offshore to nearshore. This is a safety step in that launches should be working from deeper areas up to shoaler areas near the shore. As the boats move back in forth collecting data, it is as if they are mowing the lawn. The boats always try to slightly overlap the last strip so that no data is missed. If a small spot or strip of data is missed, its like that little area of grass that didn’t get mowed. It is called a Holiday in the data, because we have to make a special trip back to gather data on that spot. Hydro Senior Survey Tech Brandy Geiger analyzes data and creates polygons for the sheet she is managing for the Woody Island Channel Survey. Senior Tech Barry Jackson, Assistant Tech Dan Negrete, Senior Tech Brandy Geiger, Chief Tech Jim Jacobson, and Senior Tech Starla Robinson look over Woody Island Channel plans to prepare for survey. 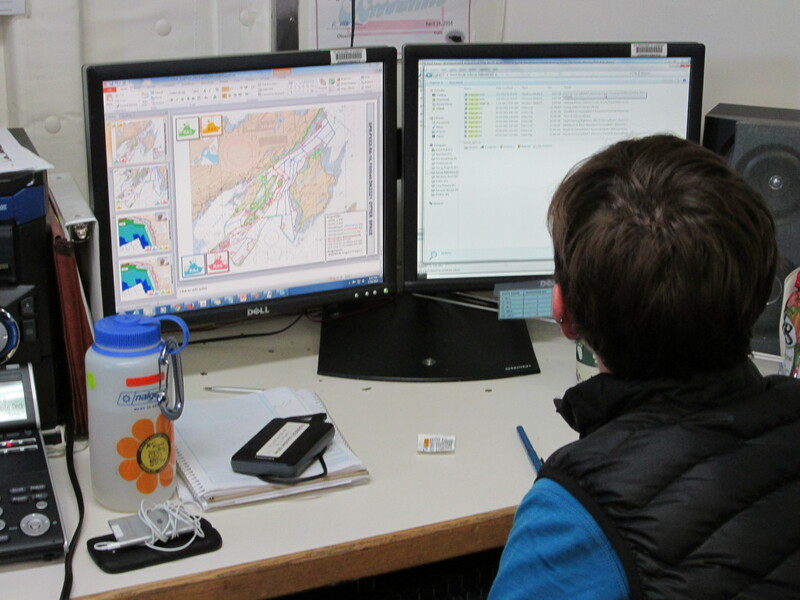 Once plans are completed, the Field Operations Officer (FOO) can plan how many survey launch boats will be deploying, who will be aboard each, and what polygons they will aim to cover each day. Aboard each launch a skilled coxswain (driver) and a Hydrographer in Charge (HIC) are needed. There is almost always a third person on board, as it is best/safest to deploy boats with one person at the bow (front), one at the stern (back) and one in the driver’s seat. Once on the water, the HIC and Coxswain have to cooperate and communicate to make an efficient and safe plan for the day. Rainier Survey Launch – RA3. 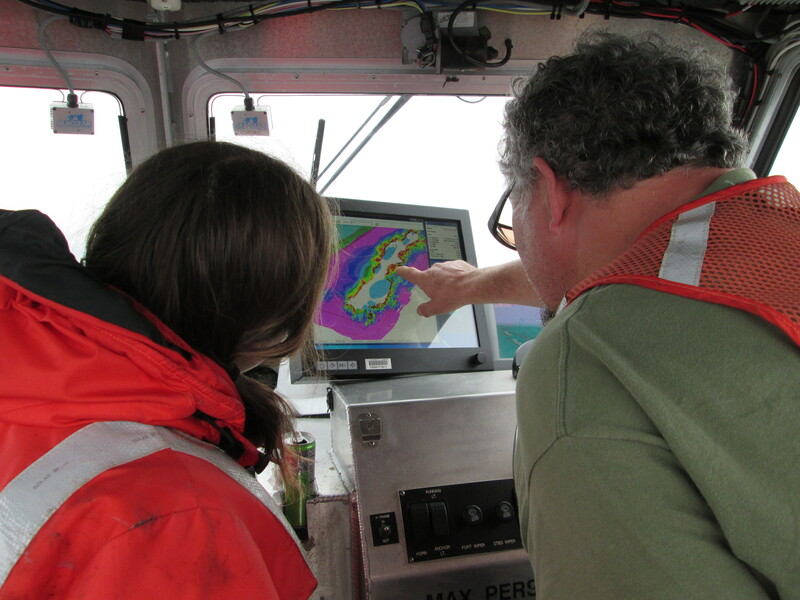 Hydrographer in Charge (HIC) Starla Robinson and Seaman Surveyor Dennis Brooks look over multibeam data together, as they safely plan next steps to survey in shoal, rocky waters. Every day is an adventure! I so enjoy learning – and it’s a good thing – because just about everything here is new to me! Enjoying this beautiful evening- oceanside! Assistant Survey Tech Thomas Burrow [from Rogers, Arkansas 🙂 ] processes multibeam data brought back from the launches. 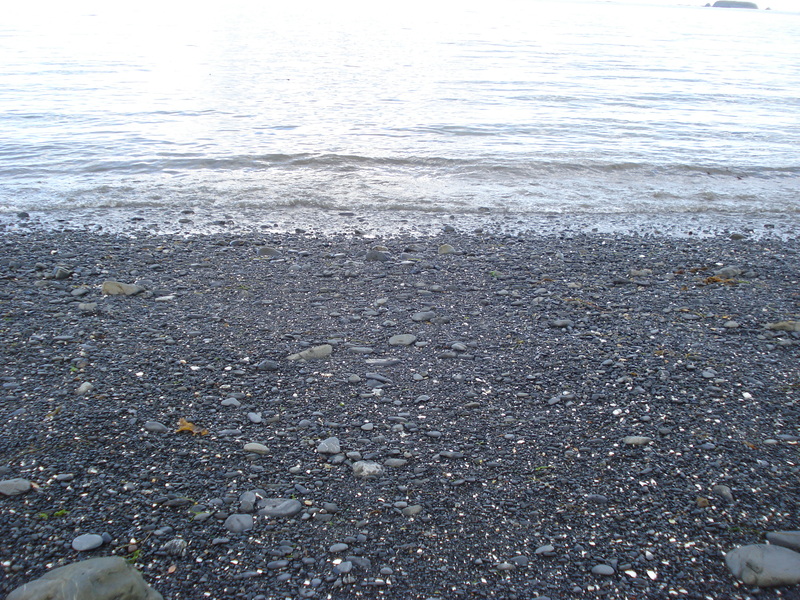 A black sand beach on the Kodiak Coast Guard Base. Observing from the Flying Bridge as the Rainer gets underway. *What observations did you make in trying to answer the trivia question about what I found in the water? 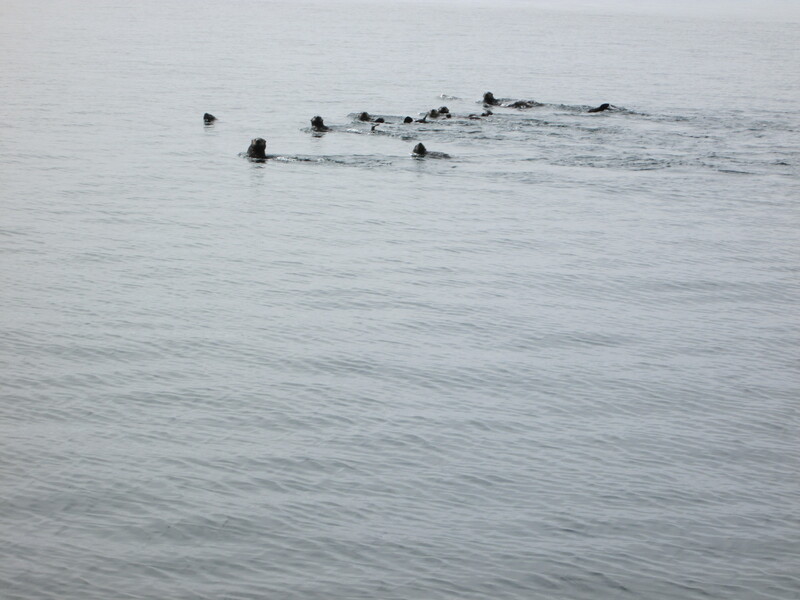 Did you decide you saw Harbor Seal, Otter, Octopus, Plants, or Aliens? You were actually seeing a plant/plants called kelp. Kelp is a large brown seaweed that often has a long, tough stalk. 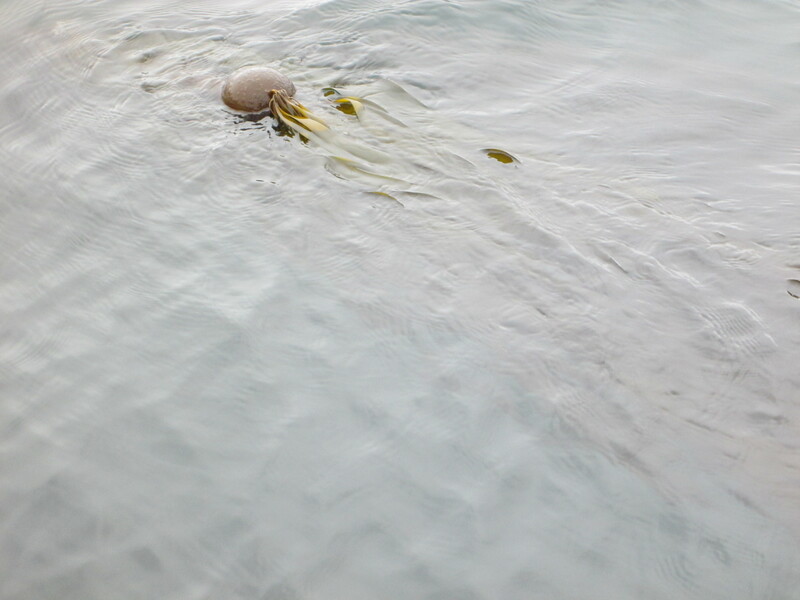 Kelp can often be found growing in and around shoal, rocky areas in the ocean. A lot of kelp in the area is a warning to boats and other vessels that shallow areas or rocky obstructions may be near by, and caution is needed. 1) What is a polygon? 2) What experiences have you had with the ocean? 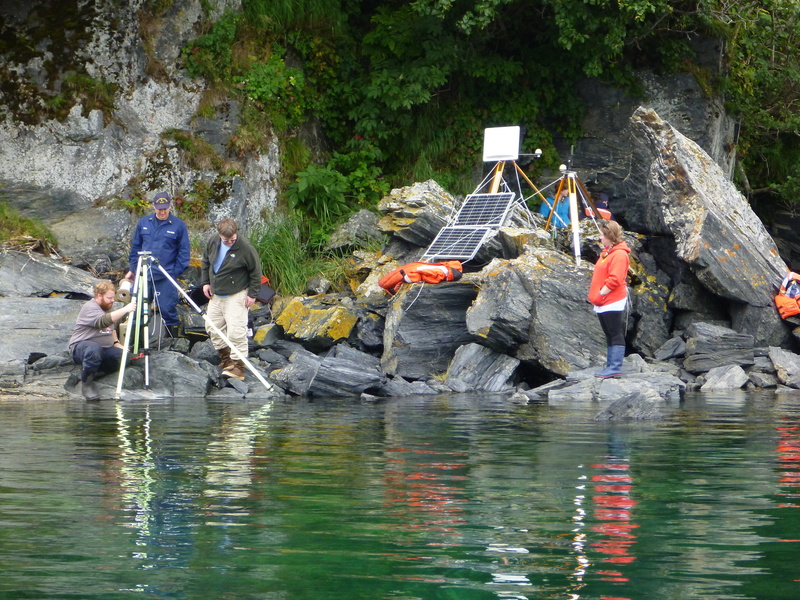 Today was ‘Day 4’ of surveying in the Woody Island Channel next to Kodiak, Alaska. The Woody Island Channel is a very busy waterway leading ships, boats, and vessels of all sizes into Kodiak. The problem at the moment is that much of the Woody Island Channel has shoals (shallow areas) and rocks. 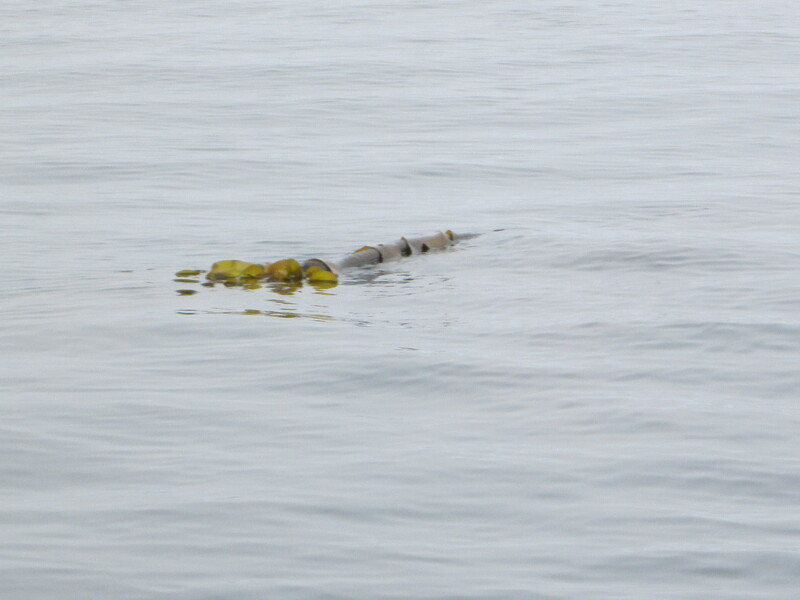 This can be very dangerous, especially since the channel has not been surveyed or mapped since the 1940’s! 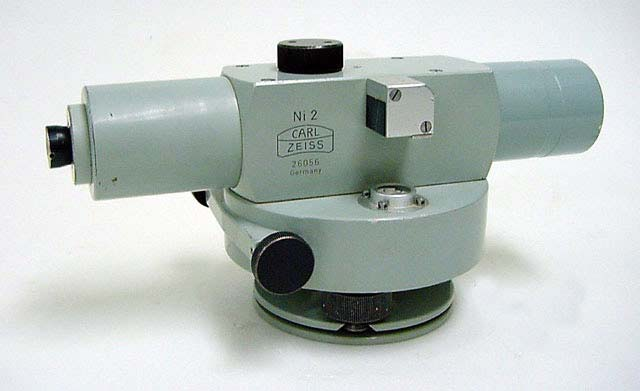 At that, in the 40s, surveyors were using Lead Lines to map the ocean floor. Lead Lines were long ropes, marked with measurements, and with a weight at the end, that were thrown out to measure the depth of the water. Lead Lines were considered very accurate for their time. The problem with Lead Lines is that there was no way for surveyors to map the entire ocean floor–the lead line only gave a measurement of depth in one location (point) at a time. 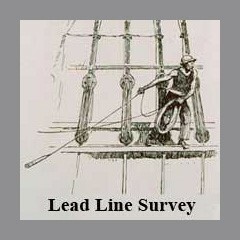 Drawing of Lead Line Survey, formerly used to survey water depths one point at a time. 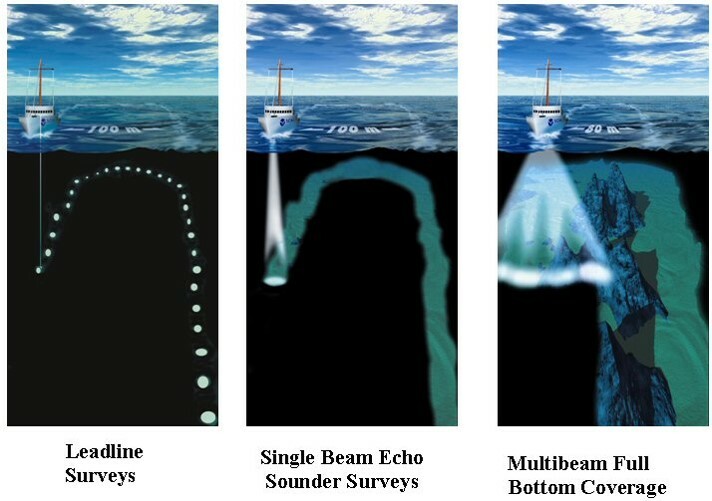 Today, NOAA Hydrographers use Multibeam Echosounders. 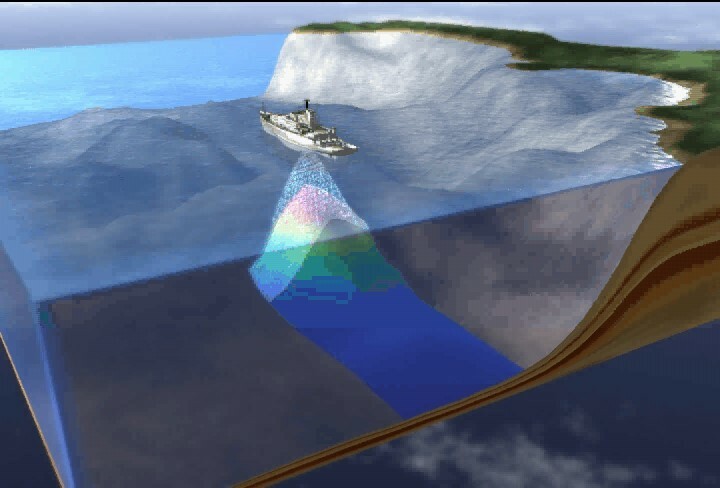 A Multibeam Echosounder uses sonar to send out hundreds of sound pulses and measures how long it takes for those pulses to come back. 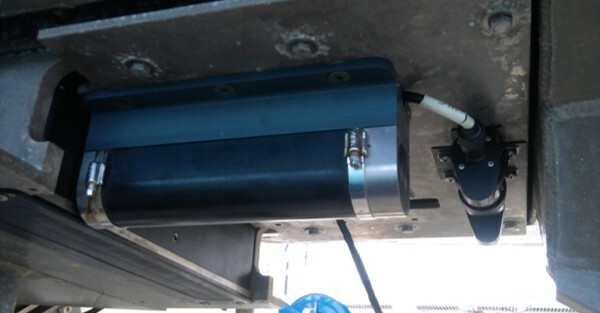 The multibeam echosounder is attached to the hull, or bottom, of the survey launches. To find out how deep the ocean floor is in an area, depths are generated by measuring how much time it takes for each of hundreds of sound pulses to be sent out from the echosounder, through the water to the ocean floor and back again. The sound pulses are sent out from the echosounder in an array almost like that of a flashlight. The deeper the water, the wider the swath (band of sound pulses). The more shoal (shallow) the water, the smaller the swath. Basically, a wider area can be surveyed when the water is deeper. 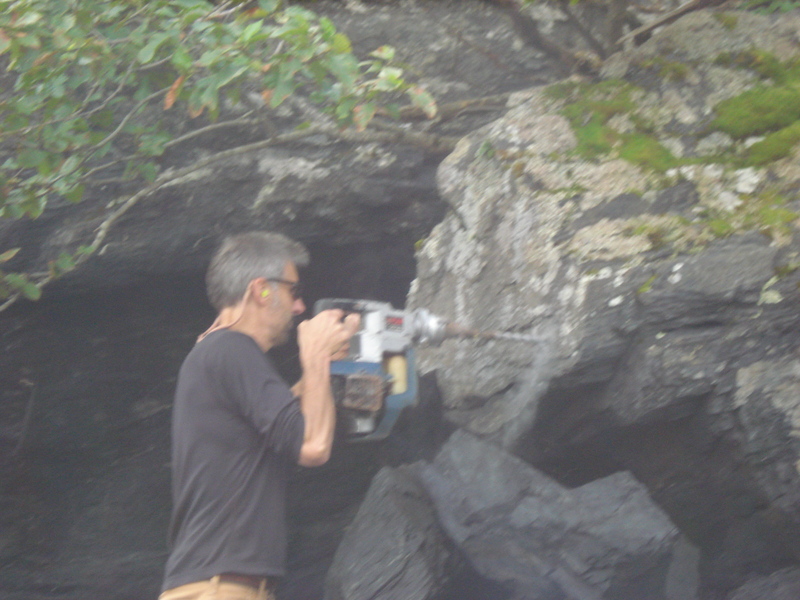 This means that surveying near shore, near rocky areas, and near harbors can be very time consuming. These surveys do need to be completed, however, if they are in navigationally significant areas, like the Woody Island Channel that Rainier is surveying right now. Image of hydrographic survey methods as they’ve changed over time. Technological advances over the years have made it more efficient and more accurate to survey the oceans. Using multibeam sonar, the Rainier has surveyed thousands of linear nautical miles of ocean in the past couple of years. In 2012 the Rainier was away from its home port in Newport, Oregon for 179 days–surveying 605 square nautical miles and 9,040 liner nautical miles. In 2013 Rainier was away from its home port for 169 days – surveying 640 square nautical miles and 7,400 linear nautical miles. 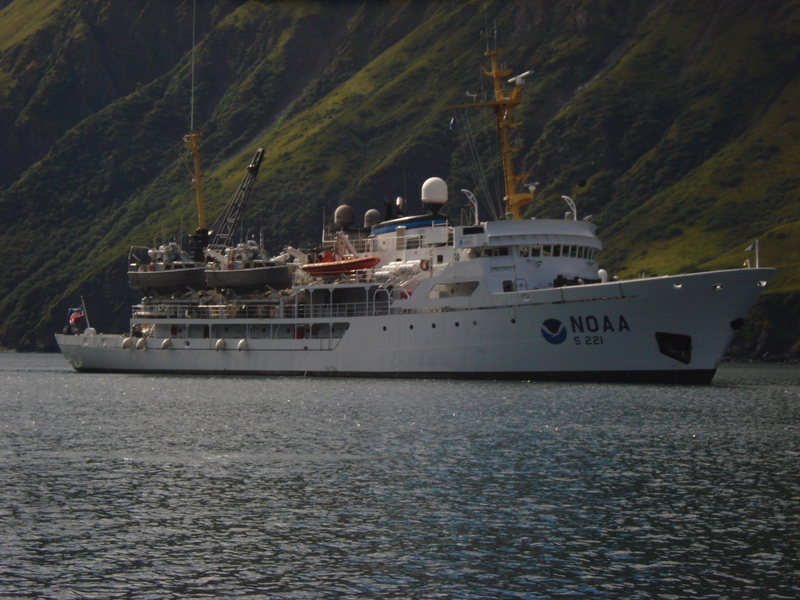 It is NOAA’s goal to get 10,000 linear nautical miles surveyed each field season between all four of its Hydro ships: Rainier, Fairweather, Thomas Jefferson, and Ferdinand R. Hassler. Several years, the Rainier has come close to this on its own! 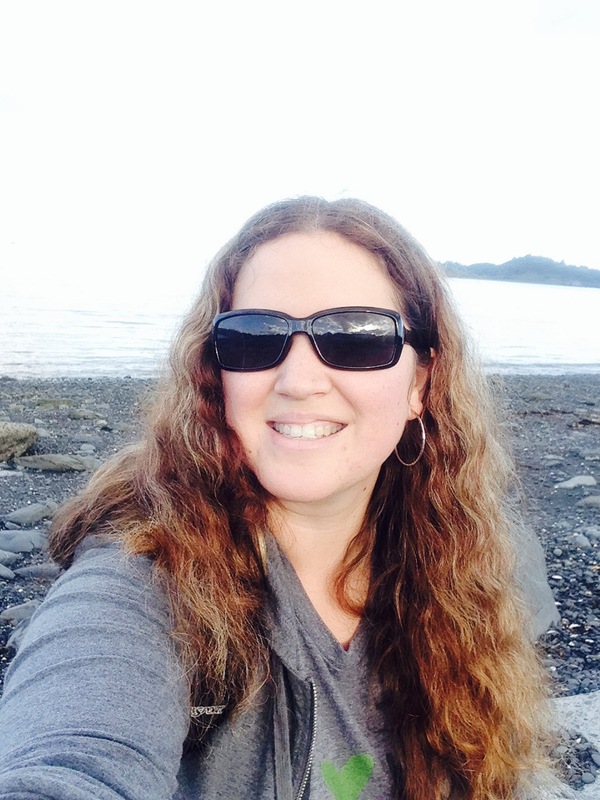 Below is an update on my Alaskan Wildlife sightings. 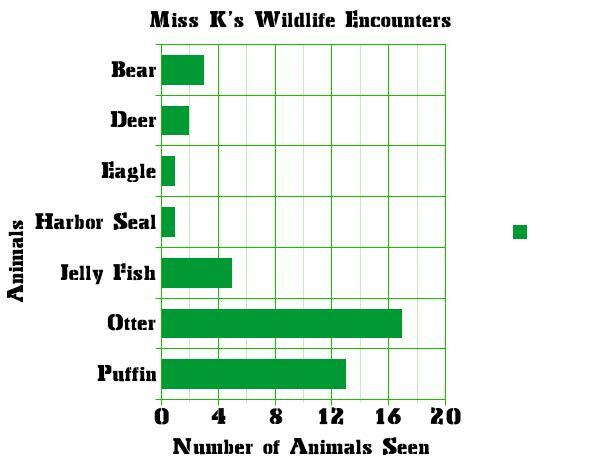 Remember, these are all animals I have been within 20 feet of (except for the bear). 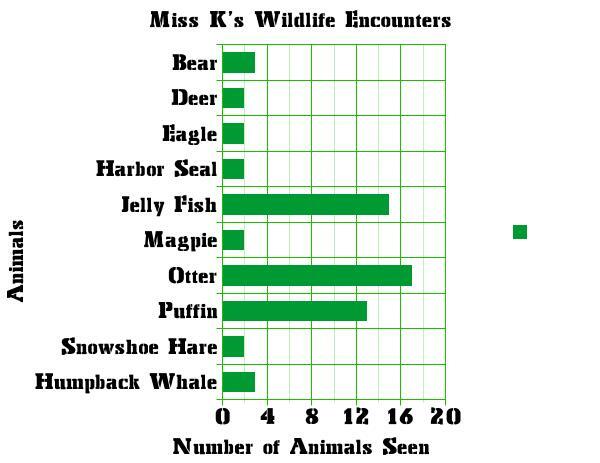 Along with the wildlife in the graph below, I have also seen hundreds of birds from a distance and several romp of otter (large groups). Can you help me identify the pictures below? 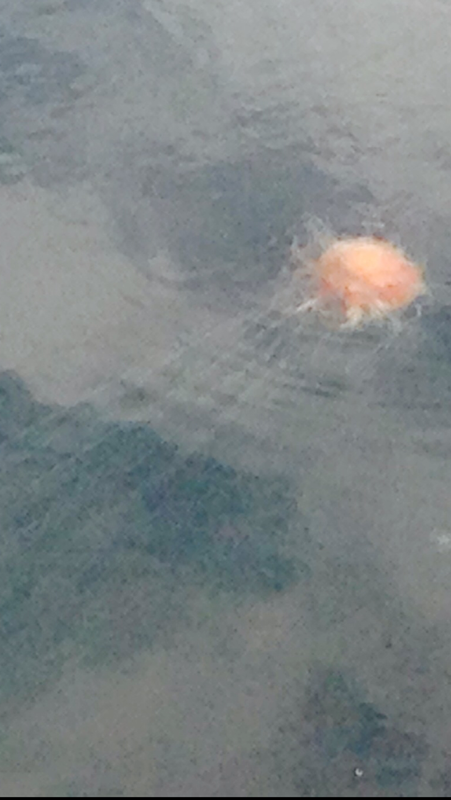 It can be quite difficult to identify creatures and “stuff” in the dark ocean waters. Plans have changed quite a bit since I first found out I would be joining the Rainier on the next leg of their mission. Instead of heading to Cold Bay as originally planned for today, several highly skilled crew members are preparing to join the Fairweather, the Rainier’s sister ship, and help get her back to Seattle, Washington, as she is done for the field season. 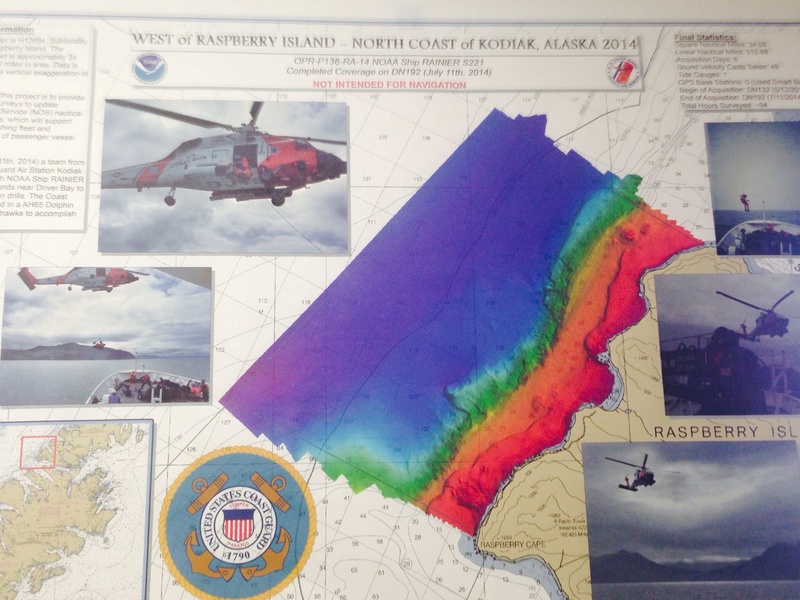 Those crew members helping out will return to Kodiak and the Rainier next week, in time to head out and survey around the other side of Kodiak Island. Until their return, the Rainier is staying “alongside”, (or docked) at the Coast Guard Base in Kodiak (the largest Coast Guard Base in the United States). NOAA Ship Rainier at the Coast Guard Base in Kodiak, AK. While we are alongside, however, there is plenty of work to be done! 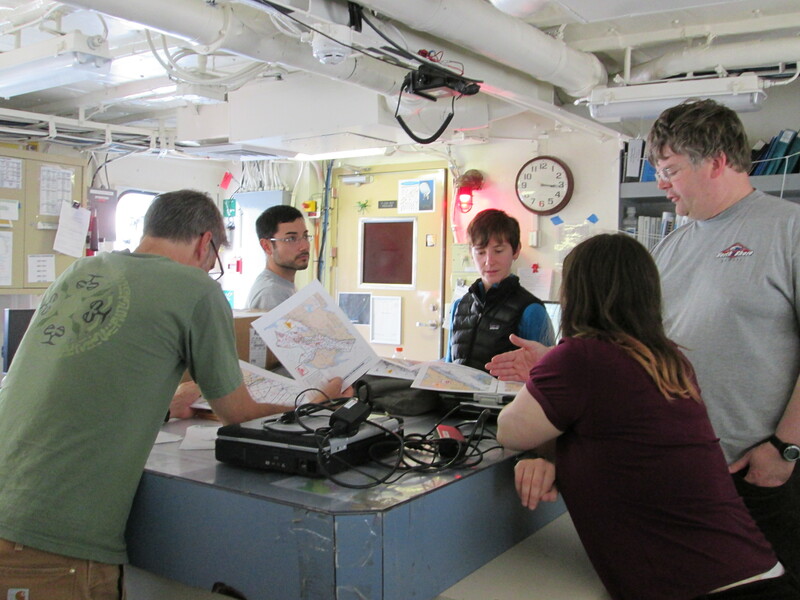 Some survey technicians are busy processing and analyzing data from past projects and surveys, while other techs are planning and preparing a survey around the Woody Island Channel, slightly Northeast of where we are currently docked. 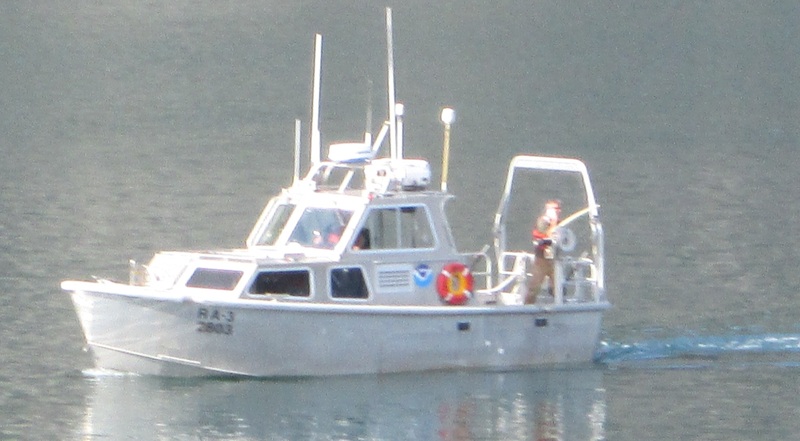 The Woody Island Channel is an important one to get surveyed, as most of the maritime traffic (traffic on the water) coming into Kodiak, goes through the Woody Island Channel. We will begin that survey work tomorrow, taking out several Launch boats (Survey Launches that are about 30 feet long, are carried aboard the Rainier and able to be deployed for survey missions) to begin gathering sounding data from the ocean floor in that area. While the survey technicians make their plans and preparations, I found myself thinking about the big picture: Why is NOAA here? Why do we need scientists mapping the ocean floor? 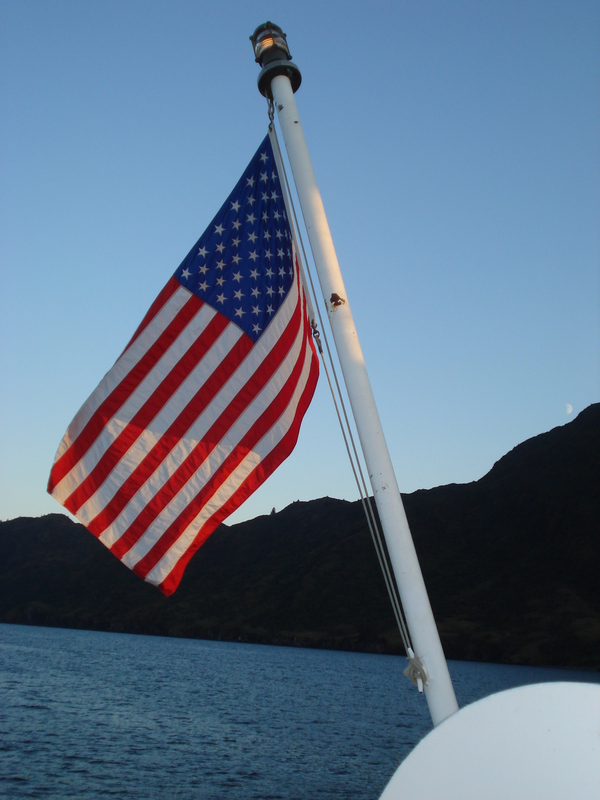 NOAA is responsible for producing nautical charts for all of our waters, including the territories. This is approximately 3.4 million square (nautical) miles of underwater territory and 95,000 linear (nautical) miles of shoreline. Looking globally, only 5% of the oceans have been mapped with modern Sonar techniques. About half of the area that is charted, is from Lead Line Soundings (some dating back to the 1800’s). And then there are places like the Arctic, that have never been mapped. Today, commerce drives the use of our oceanic highways. More than ¾ of all goods and supplies in the United States are shipped and delivered across our oceans. More than ½ our domestic oil comes by ship as well. And, the grain that we export to countries around the world, goes by ship! Without accurate survey information, these commercial ships, as well as any fishing or recreational vessels, cannot safely navigate (find their way) through different ocean routes. 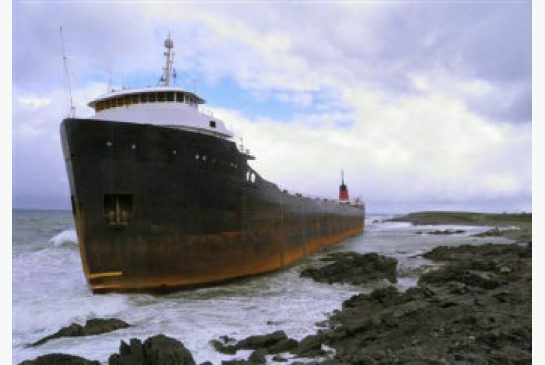 Running into an unexpected feature (underwater landform, rocks, an old wreck (shipwreck), or other obstructions) can be very dangerous and costly to any ship. Without updated nautical charts (maps), boats, ships, and vessels of any size face many unknown hazards as they try to navigate safely (often with goods we need) to their destination. 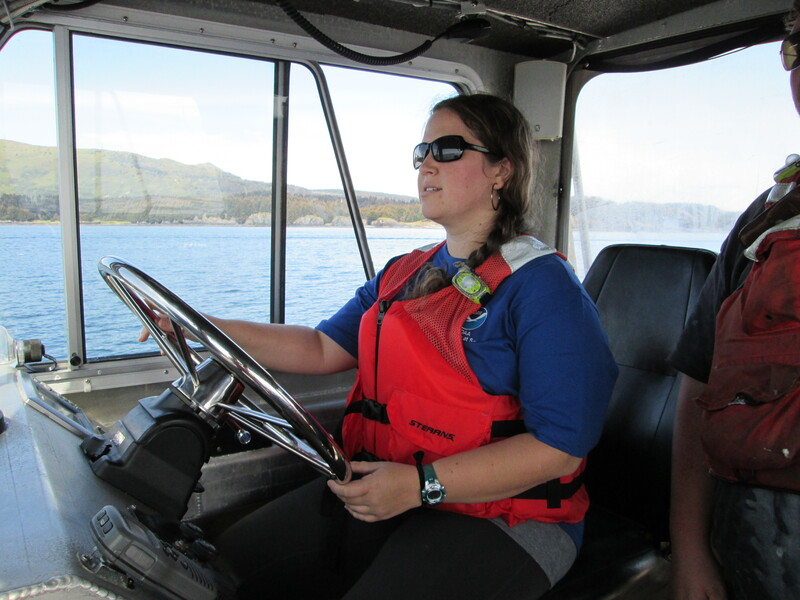 The Woody Island Channel that we will be surveying this week, is just three days in Kodiak, I have seen two freight ships, a Coast Guard Vessel near 300 feet long, and many small fishing vessels travel through this passage. The first several days in Alaska have been amazing. 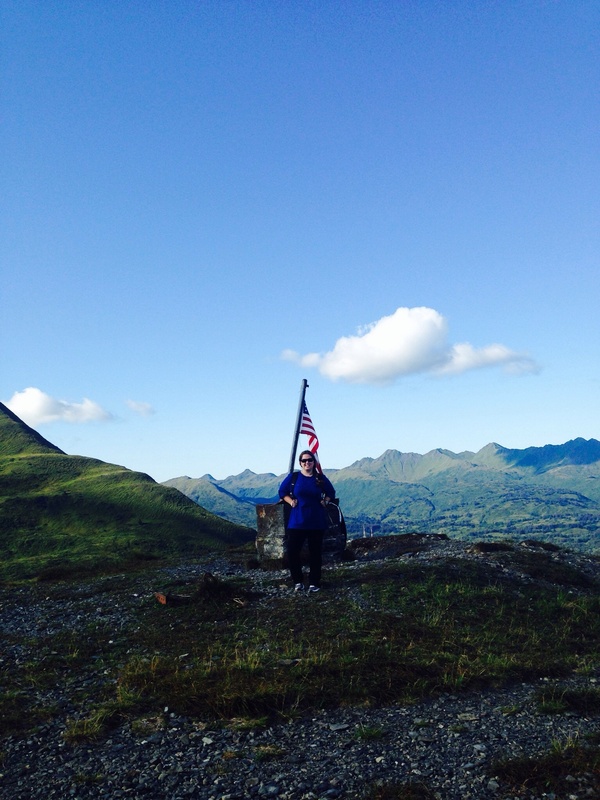 While we are alongside in Kodiak, I have been able to do some exploring after work each day! I have walked along the beach and hiked up into the mountains. Alaska is beautiful – so majestic! I have been fortunate enough to enjoy some beautiful weather, in the high 50s, and sunny most days! This is rather unusual, they tell me- it is usually starting to cool down and get very rainy this time of year. I told them I must have brought the warm weather with me from Arkansas! I am going to try and enjoy it while it lasts, as I am sure I will not luck out to spend three weeks in the sunshine! 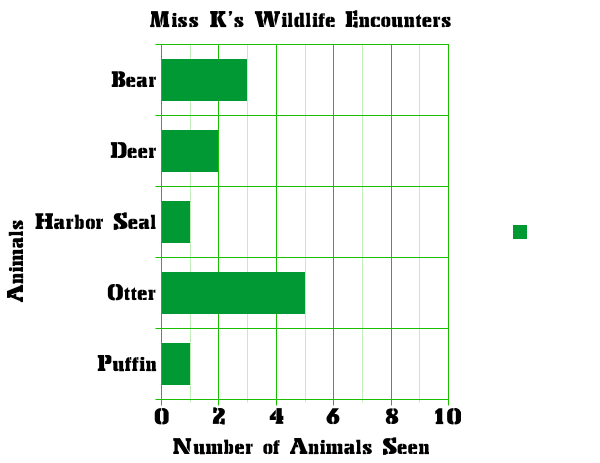 Check out this graph of the wildlife I have seen thus far! I am only tracking wildlife that I have seen UP CLOSE (within 20 feet – except for the bear – it would be dangerous to get that close to a bear)! 1. What is the difference between SQUARE miles and LINEAR miles? 2. 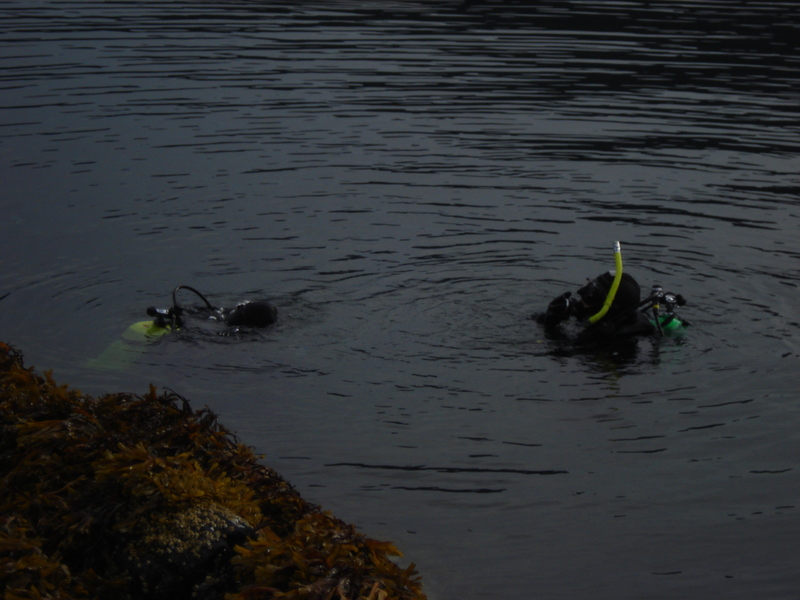 What kind of tools do you think Hydrographers (or Hydrographic Surveyors) need to survey and map the ocean floor?